Pictured: Marc Jacobs #InstaMarc Contour Powder in Mirage, Marc Jacobs Obsessed blush, Au Revoir Twinkle Pop Eye Stick, Lip pencil in Prim(rose), Highliner Gel Eye Crayon in Blacquer, and Genius Gel foundation. I’ve decided that each Sunday I would like to do a little beauty chat because I don’t want this to be place where you just read reviews on different products. I started this blog to connect with other beauty lovers and just talk about makeup and skincare. So, Sundays will now be beauty chat days! For today’s topic, I would like to know what is your favorite high end makeup brand(s)? There are so many makeup brands out there and Sephora is basically where my money goes to die (I’m not complaining :P) and they carry so many great high end beauty brands. 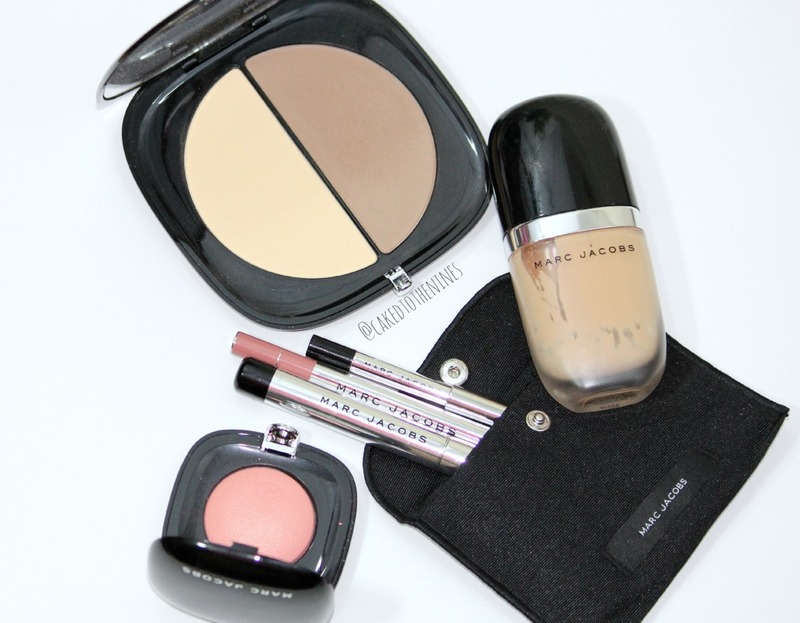 At the moment, my favorite high end makeup brand has to be Marc Jacobs. Their packaging is so sleek and their products are really great as well! I haven’t been disappointed. Granted, my collection is still fairly small, but I plan on purchasing some more goodies from them in the future. My favorites out of my little collection would have to be the #InstaMarc Contour Powder (I’ve done a review here) and the blush in Obsessed. The contour powder is that perfect cool toned powder that gives you a very natural contour and the matte yellow powder is beautiful under the eyes to highlight. The powders are extremely soft and silky so they blend beautifully and don’t look cakey. The one and only blush I own at the moment from Marc Jacobs is Obsessed, which is a warm pinky coral with a slight shimmer. This blush isn’t super pigmented, but I quite like that about this because it just adds a subtle dash of color and some radiance so it’s hard to overdo this. As much as I love pigmented products, I’m slowly beginning to love more sheer and natural products as well. Dare I say it? I am obsessed with Obsessed. The Genius Gel Foundation is very lightweight and leaves the skin looking radiant. This can cling on to dry patches, but overall I still really like it. So much that I’m almost out of it! The finish is very natural and it has a sheer to medium coverage that is buildable. I wouldn’t say it is super high coverage though, but it leaves the skin looking very beautiful. The lip liner in Prim(rose) is a beautiful nudish brown pink shade that’s very trendy right now. The consistency is very creamy and it lasts fairly long. The Highliner Gel Eye Crayon in Blacquer is extremely black and glides on so easily. Once it dries, this baby will not budge! Well worth the money! Lastly, the Twinkle Pop Eye Stick in Au Revoir is an extremely sparkly pewter shade. I love this all over the lid with messy black winged liner and lots of mascara. It dries extremely fast so it’s best to work one eye at a time otherwise you won’t be able to blend the edges out. I need to get some more of these! So, what is your favorite high end makeup brand or brands? Let me know in the comments below and don’t forget to subscribe by email for more!